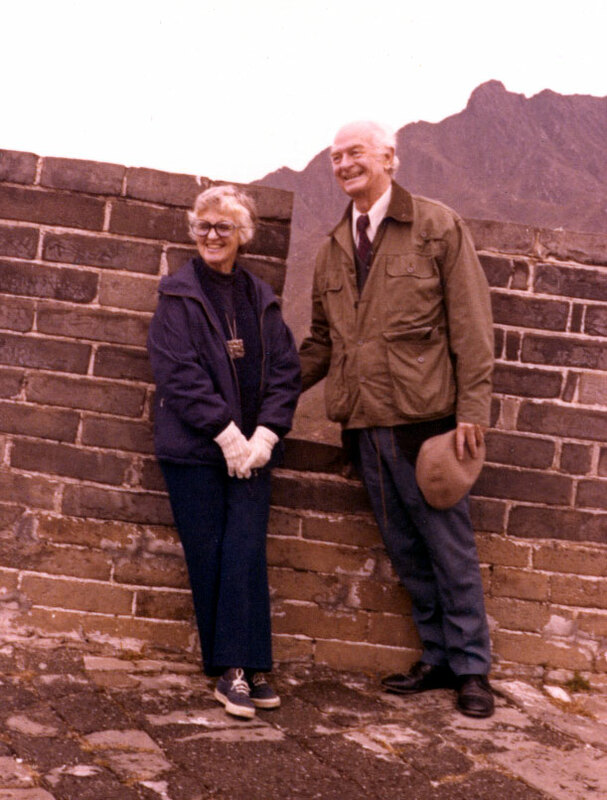 Ava Helen and Linus Pauling at the Great Wall of China, 1973. In March 1973, little more than one year after Richard Nixon’s historic visit, Linus Pauling received a letter inviting him to travel to China for three weeks in the coming summer. He was invited by Wu Yu-hsun, Vice President of the Scientific and Technical Association of the People’s Republic of China, who informed Pauling that his accommodation and transportation would be provided by the Association. “It is my belief that your visit will contribute to the promotion of the traditional friendship and scientific exchanges between the scholars of China and America,” Wu wrote. Following Wu’s instructions for obtaining a visa, Pauling wrote to the Embassy of the Chinese People’s Republic in Ottawa, Canada, on April 4, requesting visas for him and Ava Helen. (At that time, there was no Chinese embassy in the United States as diplomatic relations between the two countries had not yet been formalized.) Two months later, he received a reply from the embassy, accompanied by applications for the two visas. On August 8 Pauling wrote to Vice President Wu to let him know that the trip details had been finalized and informing him that he and Ava Helen would arrive in Hong Kong on Sunday, September 16, and leave Monday, October 8. After finally receiving their visas, the Paulings departed San Francisco for Hong Kong on Friday, September 14, 1973. They spent that night in Honolulu, and arrived in Hong Kong on Sunday, September 16. Much of what we know now about the Paulings’ visit to China comes from Linus’ travel log. The log is very detail-oriented – so much so that one wonders how much detail is owed to Pauling’s insatiable scientific appetite, and how much to his knowledge that the U. S. government was historically suspicious of his every move, and likely maintained a particular interest in his activities while traveling through communist China. The Paulings arrived in Hong Kong on Sunday night, stayed an extra day, and went by train to Canton on Tuesday. They spent Tuesday night at a guest house in Canton, where Pauling noted that it was “very hot during the day, very humid, and humid and hot during the night, too.” After visiting Sun Yat Sen University and having lunch, the couple flew to Shanghai, where Pauling judged the humidity to be less oppressive. They visited the Shanghai Industrial Exhibition on the morning of September 20, and the Institute of Biochemistry in the afternoon. 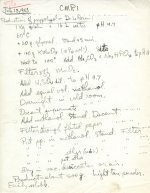 In his travel log, Pauling recorded the details of research being conducted by an Institute staff member who was working on nucleotides and nucleosides. One investigation in particular focused on the effectiveness of nucleotides in increasing the yields of different plants such as rice. Pauling also spoke with Mr. Kung who, in 1965. was among the first scientists to synthesize insulin, and a man named Lee, who was conducting work on liver cancer. Pauling was particularly interested in a screening of 150,000 people in Shanghai that was described to him by Mr. Lee. In the screening, 158 people were found to have an embryonic globulin in their blood which is manufactured in large amounts by people who have liver cancer. All of these 158 subjects either already had cancer or developed it later. Pauling suggested that the people who tested positive for this embryonic globulin be given 10 g of vitamin C per day, in an effort to stave off further development of the cancer. In the afternoon, the Paulings toured a commune. This commune was likely one of many established by Mao Zedong in the late 1950s with the aim of turning China into an industrialized nation. At the commune, Pauling took note of the work and lifestyle of its 24,000 inhabitants, who mostly made tools or did farm work. 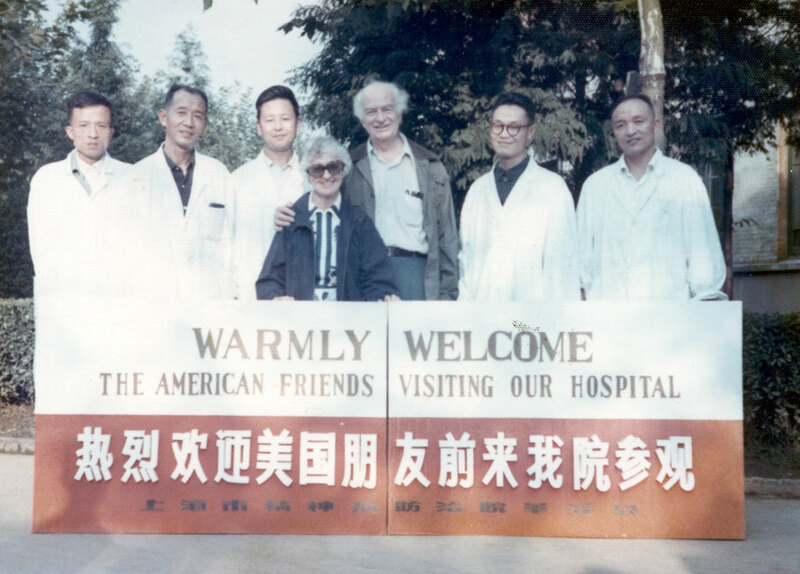 Ava Helen and Linus Pauling with hospital staff members, Shanghai, China. 1973. On Saturday, September 22, Linus and Ava Helen visited the Shanghai Institute of Pharmacology and later the Shanghai Psychiatric Hospital, where they observed a wide array of treatments being given to patients, including acupuncture. Pauling presented the director of the hospital with a copy of his book Orthomolecular Psychiatry, and discussed megavitamin therapy with the hospital’s staff. Afterwards the Paulings watched an acrobatics performance, and the next day they continued to enjoy China’s culture by visiting the Children’s Palace and the Palace of History. Although a few days are excluded from his travel log, Pauling wrote notes in his diary about activities related to hemoglobin and orthomolecular medicine on September 24, and a trip by train to Hangchow that evening, where he and Ava Helen did some sightseeing. Their tourism included the Ling Yin Temple, the Tiger Spring, the Jade Fountain, a tea ceremony, a boat ride on West Lake and a visit to a brocade factory. They attended another in a long string of banquets, and saw the Dragon Well Spring before leaving by train. Pauling next wrote in his journal on Friday, September 28, to record his and Ava Helen’s tour of a petroleum refinery. The day before, on Thursday, they had visited the big bridge across the Yangtze, after which Pauling gave a lecture on vitamin C and good health at Nanking University. On Thursday night, the Paulings went to a dancing and singing performance staged by children of the district of Nanking. That weekend, the Paulings attended the National Day banquet in Beijing in the dining room of the Hall of Ten Thousand, to which 1,000 guests were invited by the Minister of Foreign Affairs. Before the banquet, the Paulings had visited the Forbidden City once in the morning, and again in the afternoon. 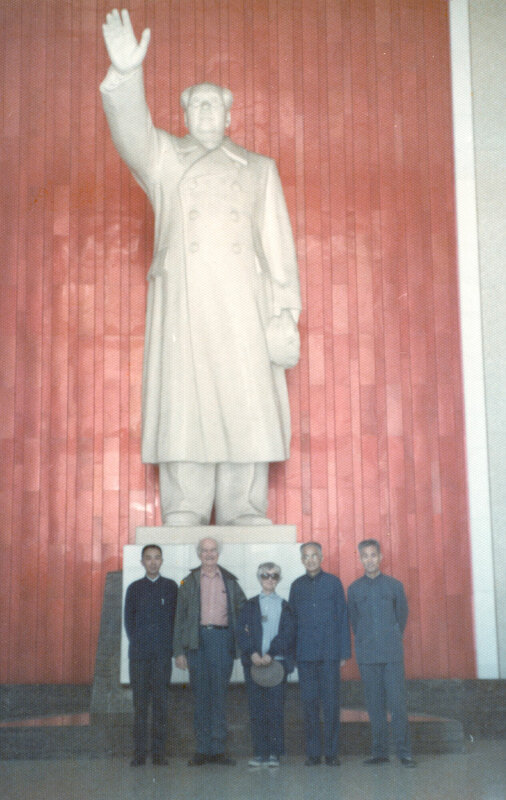 Linus and Ava Helen Pauling with three unknown individuals at a statue of Mao Zedong. China, 1973. Pauling’s log does not contain entries any further than September 30, which leaves the next few days until his departure on October 8 unaccounted for. However, other documents indicate that the Paulings did get their desired opportunity to speak with scientists Dr. Ma Hai-teh and Rewi Alley on the subject of oxypolygelatin. 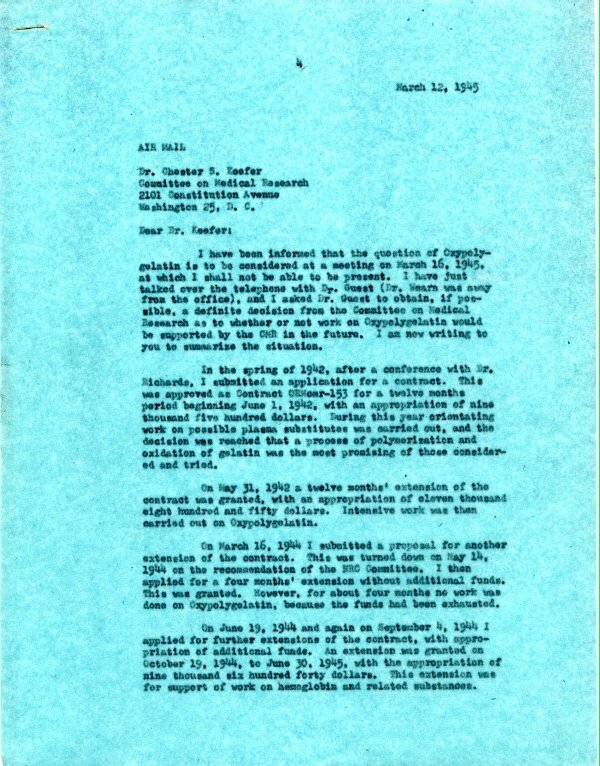 Pauling wrote to Dr. Ma a few months later, in February 1974, to tell him about further work being conducted on the substance. 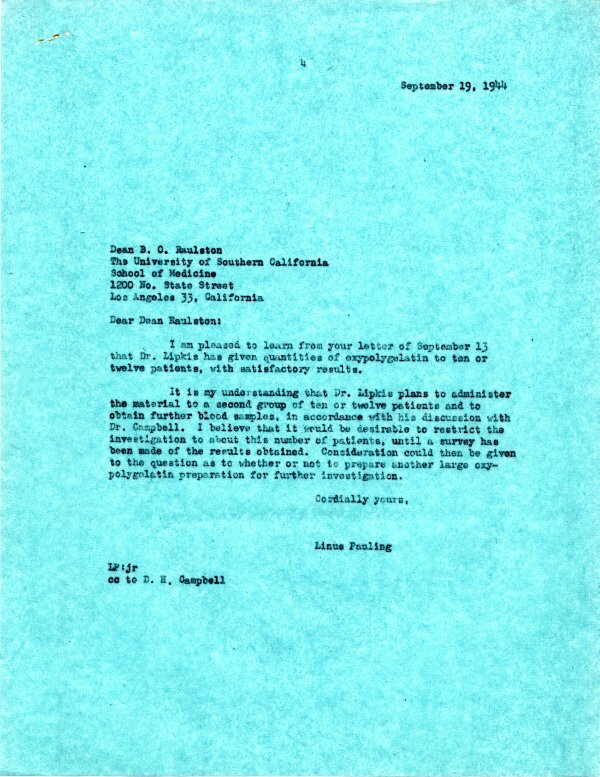 In his letter, Pauling intimated that he had the idea that the properties of gelatin as a plasma extender would be improved if the long thin gelatin molecules could be tied together into rosettes using hydrogen peroxide, such that the molecules would not escape into the dilate urine through pores in the glomerular filter. This would improve the substance’s time of retention in the body. Pauling also pointed out that oxypolygelatin is non-antigenic, while other proteins are antigenic, meaning that they cause the body to produce antibodies. Linus and Ava Helen’s first trip to China was a good experience both culturally and scientifically; one in which they were able to appreciate the historical and artistic aspects of the country while likewise engaging in scientific dialogue with Chinese scientists. While there, Pauling was able to spread the word about the benefits of vitamin C and orthomolecular psychiatry, and also to learn about research being conducted in China, including an unlikely exchange of ideas on oxypolygelatin, a substance that he hadn’t touched in some thirty years. 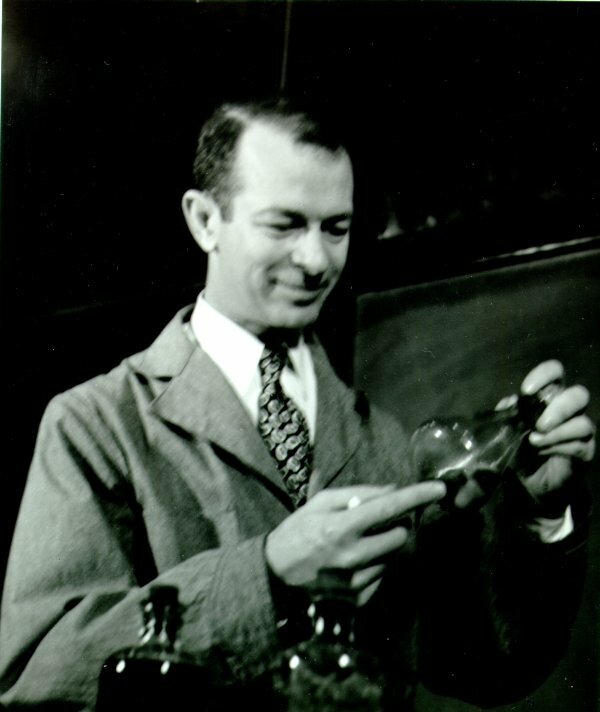 Linus Pauling in the laboratory. 1940. -Linus Pauling, letter to T. K. Sherwood, November 14, 1940. 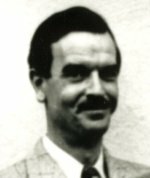 Beginning in early 1940, Dr. Paul A. Giguere, a visiting researcher from Laval University, began a study of the properties of concentrated hydrogen peroxide at the Caltech labs. Under Pauling’s watch, Giguere spent several months performing electron diffraction analyses on samples of hydrogen peroxide and hydrazine. By November, the testing had been completed and the two men wrote a brief report on their findings. Pauling, already deeply involved in the development of the oxygen meter for the National Defense Research Committee (NDRC), felt that his and Giguere’s work might net the Institute another war research contract. On November 14 he sent Thomas K. Sherwood, his primary NDRC contact, an enthusiastic letter detailing the initial findings. One early indication of Guigere’s work was that hydrogen peroxide might be used to absorb shock from explosives or rifle bullets. He also thought it possible to develop a means of controlling the evolution of hydrogen peroxide, suggesting that it could be used to produce oxygen for respirators. The laboratory intended to begin shock resistance tests immediately so that a clean set of data might be prepared, pending Sherwood’s response. Pauling received an encouraging reply from Sherwood, but it is unclear at what point further work on the hydrogen peroxide project began. 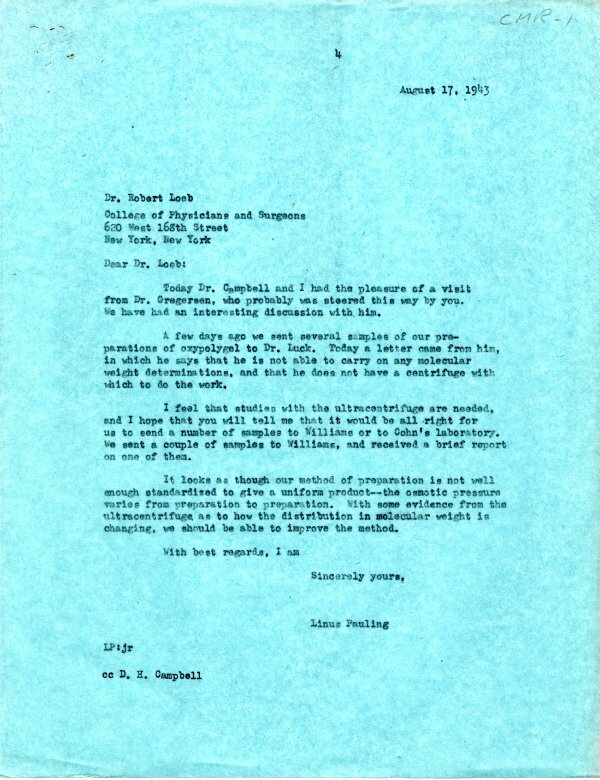 Fully two months after the initial correspondence exchange, Sherwood sent a letter to Caltech requesting a progress report from Pauling. In response, Pauling appears to have sent two letters: one detailing work on the oxygen meter and the other containing information on the hydrogen peroxide project. Unfortunately, it seems Pauling’s archives are incomplete as only the first letter remains extant. Whatever information may have been included in the second letter is lost, though we do know that Sherwood responded positively and sent Pauling data on hydrogen peroxide as a chemical fuel for combustion engines. Thomas K. Sherwood, ca. 1960s. National Academy of Sciences image. 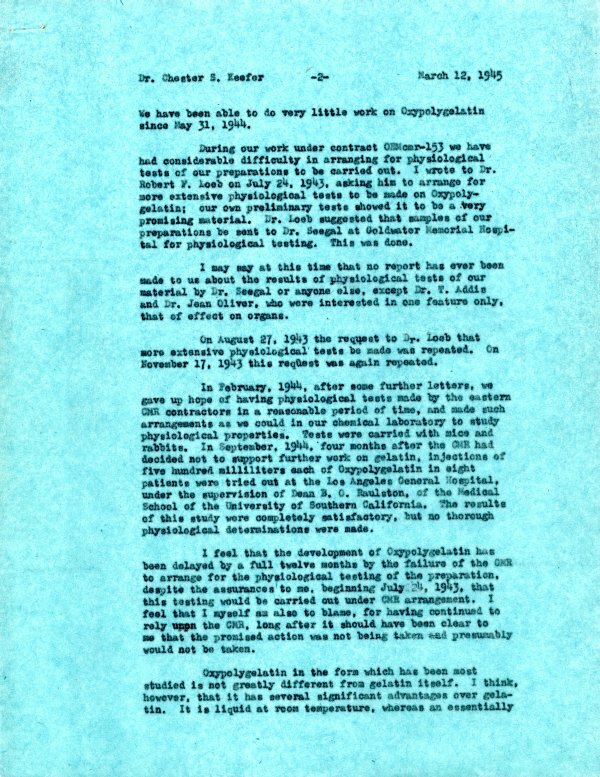 Bizarrely, following this last communication from Sherwood, no further mention of the hydrogen peroxide problem appears in Pauling’s papers until February 1943, in the form of a letter from Giguere demanding to know why Pauling’s article – presumably on his hydrogen peroxide research – had never been published. In response, Pauling reported that he and Dr. Verner Schomaker had only recently completed the manuscript and would send it on to Giguere shortly. Interestingly, this report too appears to be absent from the archives. 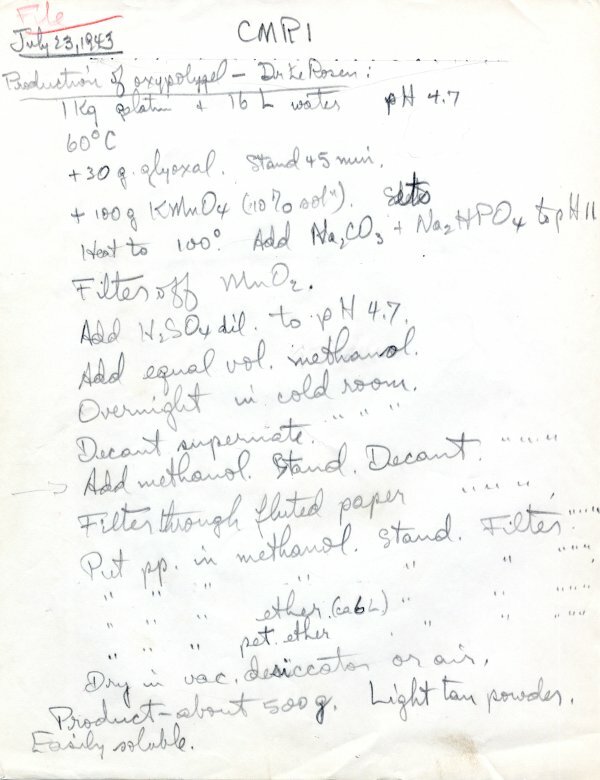 What’s more, only a single page of hydrogen peroxide research remains in Pauling’s research notebooks. This page details the decomposition of hydrogen peroxide in blood – a tantalizing entry that gives little indication of the nature of his research. It is surprising that Pauling, who maintained comprehensive records of his scientific activities, possessed so few notes on his work with hydrogen peroxide. One might speculate that perhaps certain of the materials related to this project were turned over to higher authorities within the government, as has been confirmed with other projects in which Pauling was engaged. Whatever the cause may have been for this lapse in the record, it seems plausible that Pauling’s early hydrogen peroxide work did have some long-term consequences. In 1942 Pauling began work on a war research project on the development of a plasma substitute eventually known as oxypolygelatin. This work was spawned from his private Caltech-based research into bovine gamma-globulin, possibly the cause of Pauling’s initial experiments with blood and hydrogen peroxide. It may have also been this initial investigation that led Pauling to use hydrogen peroxide in the creation of oxypolygelatin. Unfortunately, without letters, reports or laboratory data to review, it is impossible to know exactly what Pauling’s hydrogen peroxide research entailed or how it affected his later research. It seems then, that this particular project will remain one of many small mysteries in Pauling’s life. Before America’s involvement in World War II, Linus Pauling was openly in favor of intervention to stop the spread of fascism, a menace that he considered dangerous to the stability of world peace. He was horrified by stories emerging from Europe, some pertaining to the treatment of well-respected scientists. He later received pleas from colleagues who were unable to attain visas and thus escape to the United States, and was disturbed and saddened by his inability to aid acquaintances that desperately sought his help. Throughout the ensuing military engagement, the U.S. government financed research at levels unheard of in previous times. Linus Pauling and many others at Caltech gladly aided the war effort in their own way, and benefited greatly from generous war time funding in the process. Several divisions of the Institute changed dramatically as a result, responding to the growing needs of the armed forces. 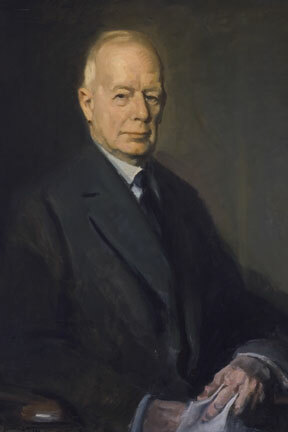 Pauling oversaw the development of several devices and innovations, mostly medical in nature, that were meant to be used for the war effort. Near the beginning of the war, he co-manufactured an apparatus that could measure oxygen levels in submarines using a magnetic field. Towards the war’s end, he was developing an artificial substitute for blood plasma, which received substantial attention from the press. He also spent a considerable amount of time examining and testing combustible powders at Caltech’s rapidly expanding powder-research facilities. 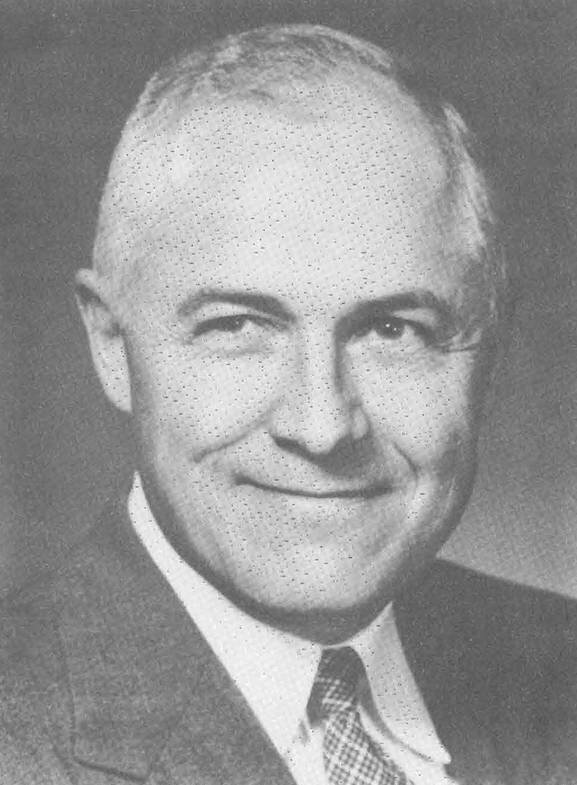 As the war was drawing to an end however, Pauling began shifting his research focus from federally funded war projects to Rockefeller-oriented protein work. Though Pauling was mildly active in political affairs before the onset of the war, he tended to keep such views private. He was often too caught up in his work to spare much attention for such things, but he also valued principles of neutrality and objectivity, qualities that stemmed from his scientific research and academic training. Pauling began to change his mind however, when faced with a growing mix of racism, extreme nationalism and atomic peril. Among other stimuli, including countless discussions with Ava Helen, two particular events affected Pauling’s willful political silence during the course of the war. The first incident involved a talented Japanese-American student. Caltech resided in a zone that required all Japanese and Japanese Americans within to move to internment camps. Realizing the seriousness of his plight, the student turned to Pauling for help. After a difficult search, Pauling finally found him a job on the east coast, but the injustice of the affair caused Pauling some discomfort. A second event involved George H. Nimaki, a returned Japanese-American evacuee, who was temporarily employed by the Paulings as a gardener at their home. One morning in March of 1945, the Paulings woke up to graffiti on their garage door. 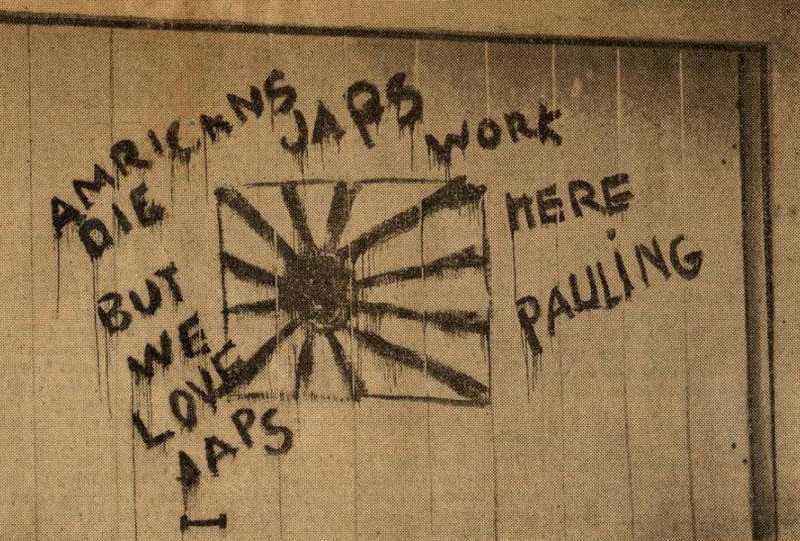 Some one had painted, in bright red, “Americans die but we love Japs – Japs work here Pauling” alongside an image of the rising sun flag. Pauling was appalled, and equally appalled by subsequent threats made against him and his family after he spoke out in condemnation of the incident. These two events began to shift Pauling towards a more active and open involvement in public affairs. Another would soon cement this attitude. On August 6th, 1945, the United States dropped an atomic bomb on Hiroshima, Japan. Another bomb was dropped on Nagasaki a few days later. Among other less apparent ramifications, the use of the bombs signaled the end of the war. The day after the first bomb was dropped on Nagasaki, a day he never forgot, Pauling read of the story in a local newspaper. He was immediately interested in the physics of the bomb, but did not share in the euphoria that was sweeping the nation. During the war Pauling had been offered a spot at the chemistry division of the Manhattan Project, where the atomic bomb was developed, but he had had little personal interest in the opportunity. Following the bombings in Japan, groups of concerned scientists that had accepted the Los Alamos offer began discussing the effects of their work. The devastation which resulted from the use of atomic weapons began to weigh heavily on many of them. Consequently, they began distributing information about the role that atomic weapons might play in a rapidly changing world. [Samuel] Allison has made a strong public statement against keeping the A-bomb secret from Russia. . . I think that Union now with Russia is the only hope for the world. 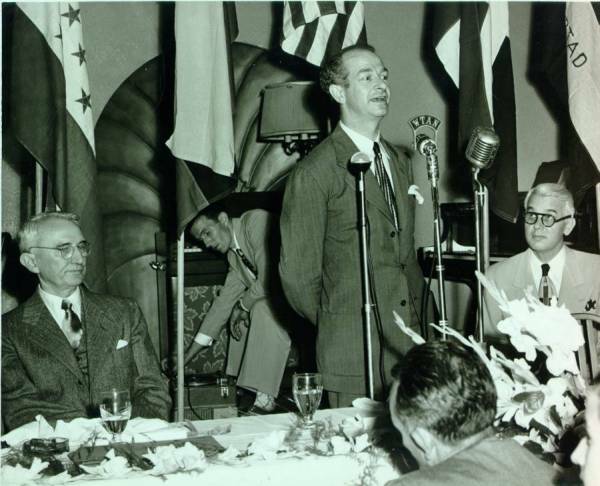 Pauling learned more and more about the science of the bomb, and began giving talks around southern California, his first at the Rotary Club in Hollywood. As time went on, he began to incorporate international relations and politics into his talks, but most people found his non-science discourse dry and unconvincing. After one of these early speeches, Ava Helen told Pauling that he should stop discussing war and peace. He later wrote that her comments changed his life. Pauling struggled with the advice, plagued by inner turmoil. We must all strive for that great goal of world union – of perpetual unity between nations . . . all that remains now is for the final steps to be taken. The steps that lead to union of the great powers. And the world will be safe forever, and we shall see the beginning of a new era of continuing peace and happiness. In the years following the end of the war, Pauling maintained a great faith in the possibility of world peace. As a result, he became involved with a number of organizations and issues that would later be subjects of substantial controversy. Early in his new-found political advocacy, Pauling enjoyed a minor victory in the form of the defeat of the May-Johnson Bill. According to its opponents, the bill would likely have given the military near-complete control over atomic weapons and technology, though ostensibly with the cooperation of scientists and civilian board members. The victory was short lived however. A fast-growing political movement that was both pro-nuclear and exceedingly anti-communist began to overwhelm members of organizations that valued peace and international cooperation. The following years would test Pauling’s commitment to the peace movement, as well as his personal and social convictions. 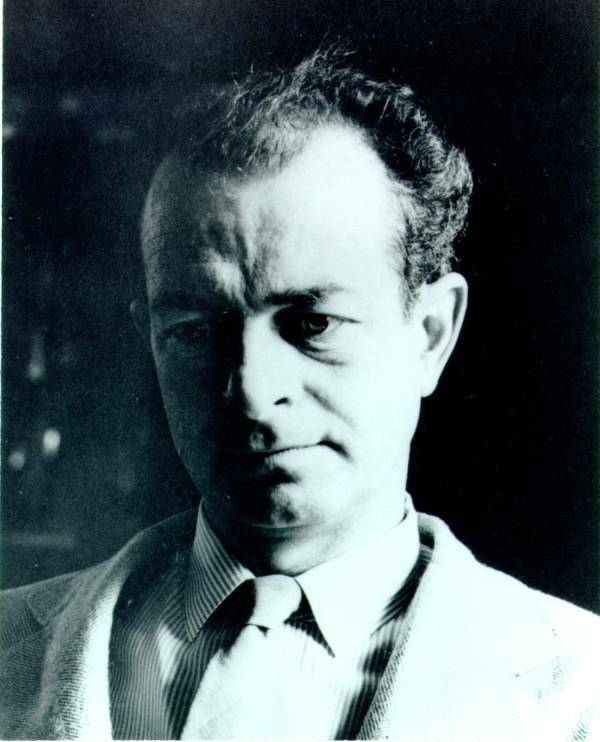 Linus Pauling, October 15, 1947. After developing a promising blood plasma substitute during World War II, Pauling found his funding cut and his contract with the Office of Scientific Research and Defense coming to an end. Rather than abandon the project, the Caltech researchers chose to forge ahead. Frustrated with the lack of progress, Pauling and his team scraped together enough residual funds to allow for one more series of experiments. Pauling began injecting mice and rabbits with his synthetic plasma, carefully monitoring their health and examining blood samples to determine the effects of the treatment. The results were satisfactory but not enough to put the project back in the good graces of the Committee on Medical Research. Pauling knew that the only way to stimulate interest (and funding) for the project was to prove that his substance could be used in humans. In September of 1944, twelve patients at Los Angeles General Hospital were injected with Oxypolygelatin, all exhibiting favorable reactions. Pauling had the results he needed. 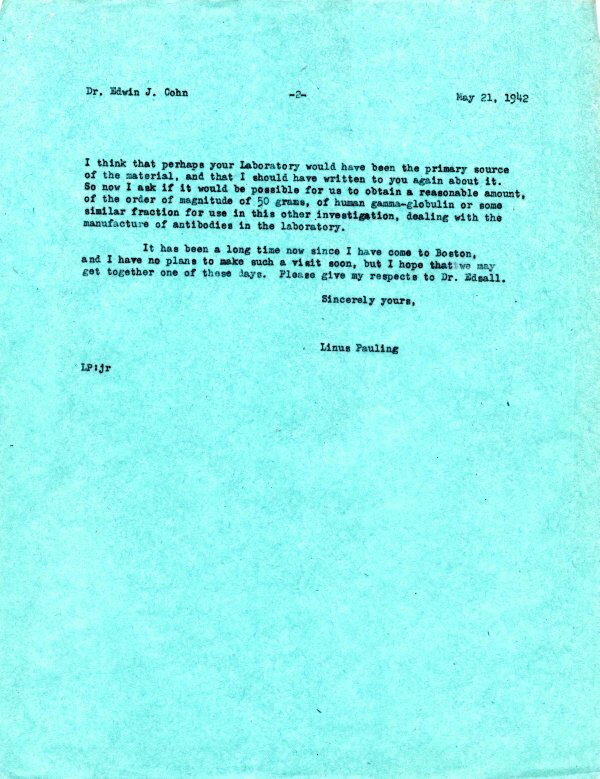 Letter from Linus Pauling to B. O. Raulston, September 19, 1944. Statement of Work Carried Out Under Contract OEMomr-153, 1944. Page 1. Statement of Work Carried Out Under Contract OEMomr-153, 1944. Page 2. 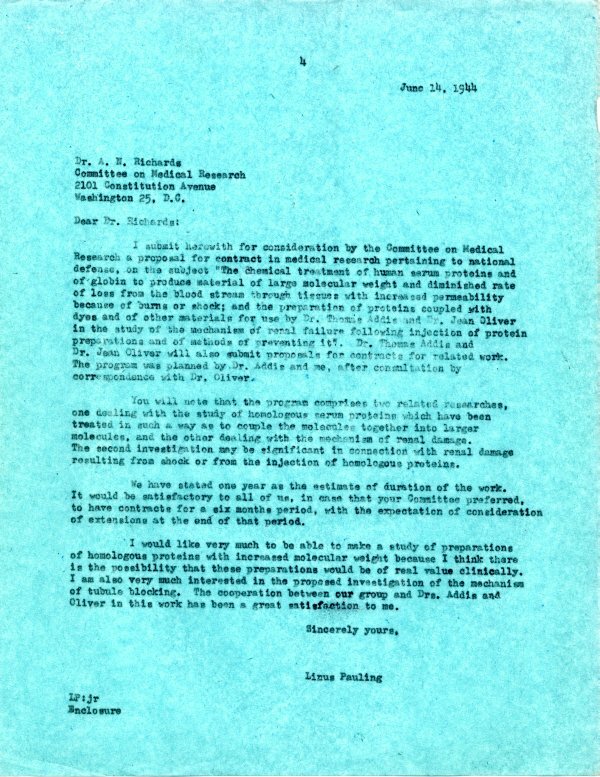 In a final effort to save the project, Pauling submitted one last application, noting the success of his experiments with both animal and human patients. To aid his cause, Pauling attempted to find support at the source, sending individual letters to key members of the CMR. 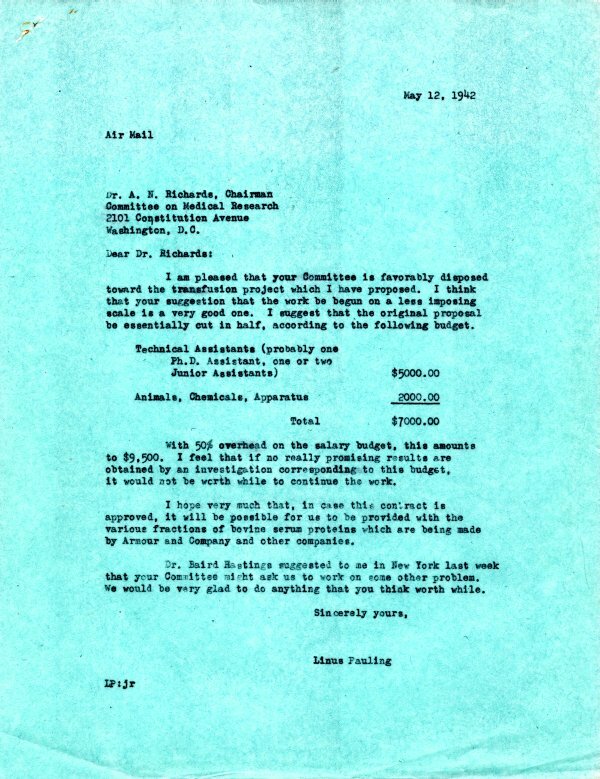 In October of 1944, the CMR responded to his requests for aid, providing a $10,000, nine-month grant. The CMR had previously assured Pauling that the Committee would arrange any necessary physiological tests that could not be completed at Caltech and, upon the renewal of the Oxypolygelatin contract, they reaffirmed this promise. It looks as though our method of preparation is not well enough standardized to give a uniform product – the osmotic pressure varies from preparation to preparation. With some evidence from the ultracentrifuge as to how the distribution in molecular weight is changing, we should be able to improve the method. The lack of uniformity in the substance was a problem for Pauling and his team. In order to locate the irregularities, the researchers needed results from a series of physiological tests. Unfortunately, the CMR had yet to arrange for the promised tests and Pauling’s grant was about to expire. 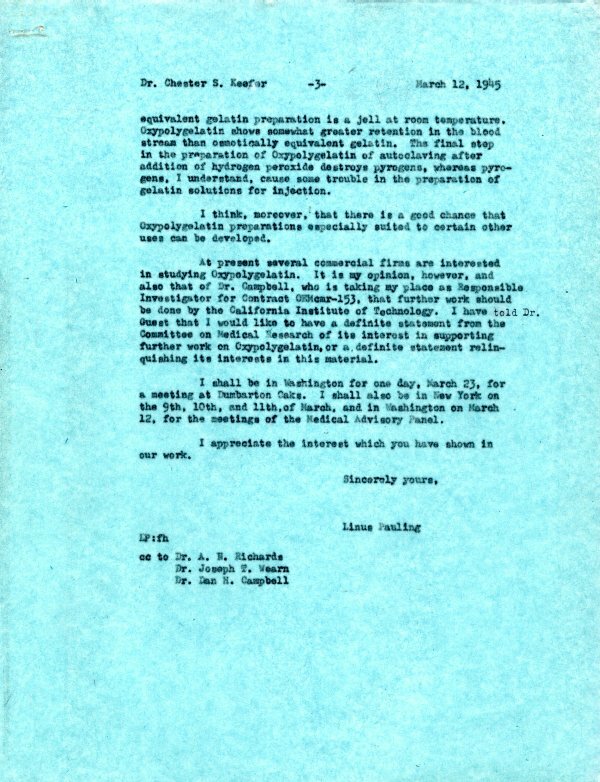 Letter from Linus Pauling to Robert Loeb, August 17, 1943. 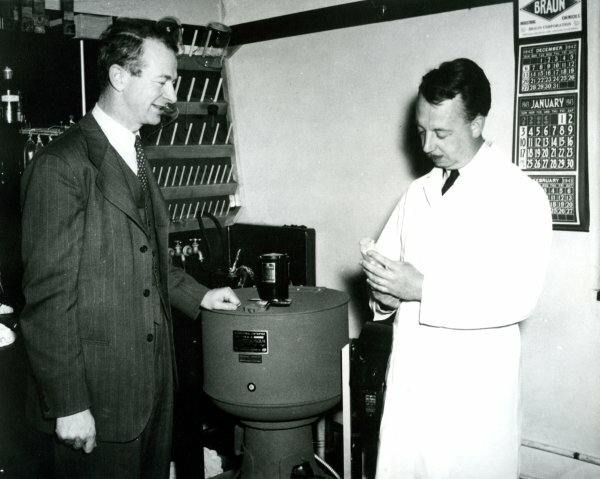 I feel that the development of Oxypolygelatin has been delayed by a full twelve months by the failure of the CMR to arrange for the physiological testing of the preparation, despite the assurances to me, beginning July 24, 1943, that this testing would be carried out under CMR arrangement. I feel that I myself am also to blame, for having continued to rely upon the CMR, long after it should have been clear to me that the promised action was not being taken and presumably would not be taken. Letter from Linus Pauling to Chester Keefer, March 12, 1945. Page 1. Letter from Linus Pauling to Chester Keefer, March 12, 1945. Page 2. Letter from Linus Pauling to Chester Keefer, March 12, 1945. Page 3. The project was dead. The CMR had lost interest and no lab in the country was either willing to or capable of performing the tests Pauling required. Even worse for the project, Germany was on the brink of surrender and Japan was losing ground in the Pacific; the war would be over soon and with victory would come the closure of war research programs all over the country. The team quietly disbanded, each member returning to old projects or starting up fresh lines of research. In 1946, Pauling, Koepfli and Campbell filed for a patent for Oxypolygelatin and its manufacturing process which they immediately transferred to the California Institute Research Foundation. 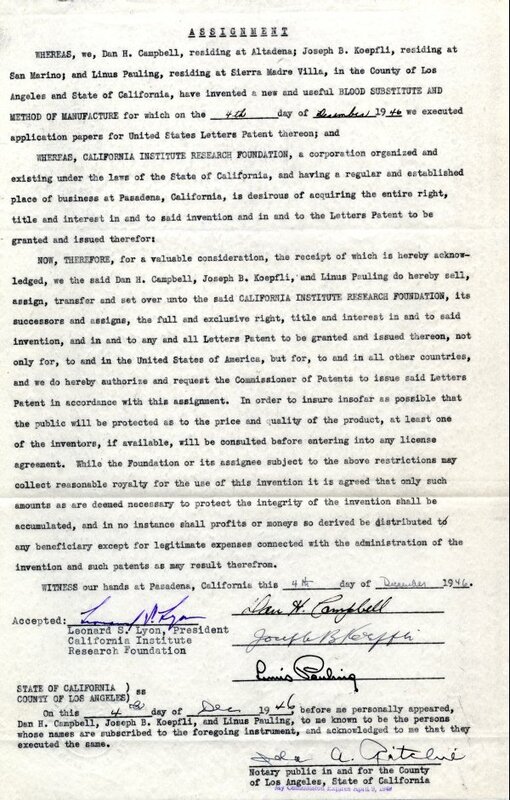 Oxypoly-gelatin patent agreement, December 4, 1946. In 1947, the American Association of Blood Banks was founded and in 1948 the American National Red Cross began widespread blood donation campaigns. The genesis of the two programs allowed for large supplies of fresh blood to be dispersed throughout U.S. hospitals on a regular basis, virtually eliminating the need for a plasma substitute during peacetime. While Pauling was the source of many scientific breakthroughs during his career, in the end Oxypolygelatin was a failed project. Over the following years, he would occasionally discuss his blood plasma work with an interested scientist or mention it at a symposium address, but he never returned to the Oxypolygelatin problem. 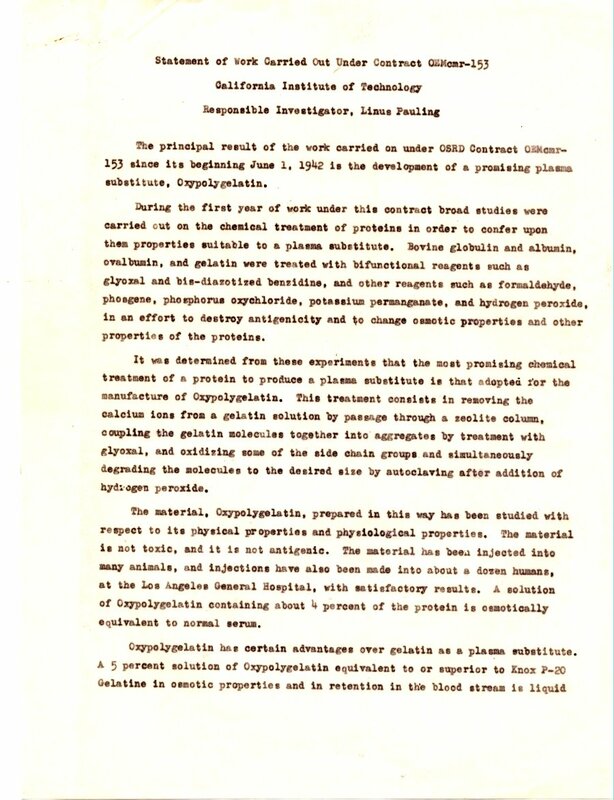 For more information on Pauling’s Oxypolygelatin research, read his 1949 project report or view this 1974 letter regarding the development of Oxypolygelatin production in China. For additional Pauling content, visit Linus Pauling: It’s in the Blood! or the Linus Pauling Online portal. An original container of 5% Oxypolygelatin in normal saline. 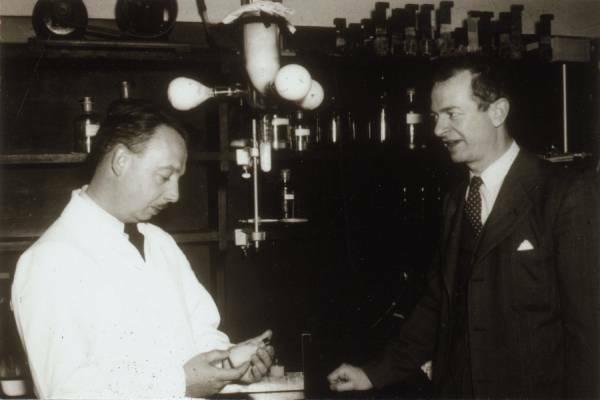 In 1941 Linus Pauling began a limited program of study on bovine and human γ-globulin, a project stemming from his interest in the manufacture of antibodies. Pauling initiated experimentation with the preparation of antisera – blood sera containing defensive antibodies – and in the process quickly became an authority on the chemistry of human blood and hemoglobin. Following the Japanese attack on Pearl Harbor and subsequent U.S. entrance into World War II, the federal government issued a national call for research with wartime applications. Thanks to his ongoing immunological work, Pauling was already a step ahead of his fellow scientists. In April 1942, Pauling submitted a contract proposal to the Committee on Medical Research (CMR) of the Office of Scientific Research and Development (OSRD). Entitled “The Chemical Treatment of Protein Solutions in the Attempt to Find a Substitute for Human Serum for Transfusions,” the proposal outlined a plan to develop a gelatin-based substance which could be used as a plasma substitute. The project, if successful, would produce a synthetic material that would take the place of donated human blood plasma in transfusions, aiding Allied soldiers when America’s peacetime blood reserves ran low. The Committee on Medical Research accepted Pauling’s proposal and within two weeks Pauling had assembled a group of researchers, including doctors J.B. Koepfli and Dan Campbell, an immunology expert. After securing materials from Edward Cohn and other American-based scientists, the team was ready to begin. Linus Pauling to Edward Cohn, May 21, 1942, page 1. Linus Pauling to Edward Cohn, May 21, 1942, page 2. Pauling’s idea for a plasma substitute was not an unfamiliar one. Gelatin was already in use as a plasma replica during the late 1930s and early 1940s, but its viscosity and tendency to gel at room temperature made it a poor candidate. The U.S. military needed something quick and efficient that could be used in field hospitals with minimal preparation. The Caltech team, however, was not yet ready to discard gelatin as a potential candidate. Pauling hoped that, through chemical processes, he might be able to transform standard commercial-grade gelatin into a workable substance. Between June 1942 and May 1944, Caltech received approximately $20,000 from the CMR in support of the project. During that time, Pauling and his team were able to successfully develop a possible plasma substitute through the polymerization and oxidation of gelatin. Notes by Linus Pauling re: the production of oxypolygelatin, July 23, 1943. This substance, first referred to as polyoxy gelatin and eventually known as Oxypolygelatin, was superior to its unmodified counterpart in several ways. 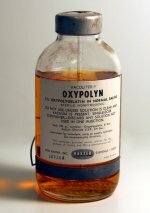 Because it was a liquid at room temperature, Oxypolygelatin did not require the same pre-injection heating that previous substitutes required, allowing it to be used quickly and without the help of heating implements. Furthermore, thanks to the creation of large chain-like molecules during the preparation process, oxypolygelatin was retained in the bloodstream for longer periods, allowing the patient’s body more time to manufacture natural plasma. Finally, where gelatin contained pyrogens (fever-causing substances), Oxypolygelatin did not – a property that was due to the addition of hydrogen peroxide, a substance capable of destroying pyrogens. To a chemist’s eye, Oxypolygelatin appeared to be an acceptable substitute for human plasma. Unfortunately, Pauling knew his own tests were not enough to convince the CMR of the substance’s viability. What he really needed was a medical expert’s stamp of approval. Pauling called on Dr. Thomas Addis – a kidney expert whom history now credits with curing Pauling’s near-fatal case of glomerular nephritis – to analyze the effects of Oxypolygelatin on human organs. Addis accepted the challenge, bringing fellow researcher Dr. Jean Oliver to the project as well. Over the next two years, Addis and Oliver would subject Oxypolygelatin to a battery of tests, eventually confirming its potential as a plasma substitute. 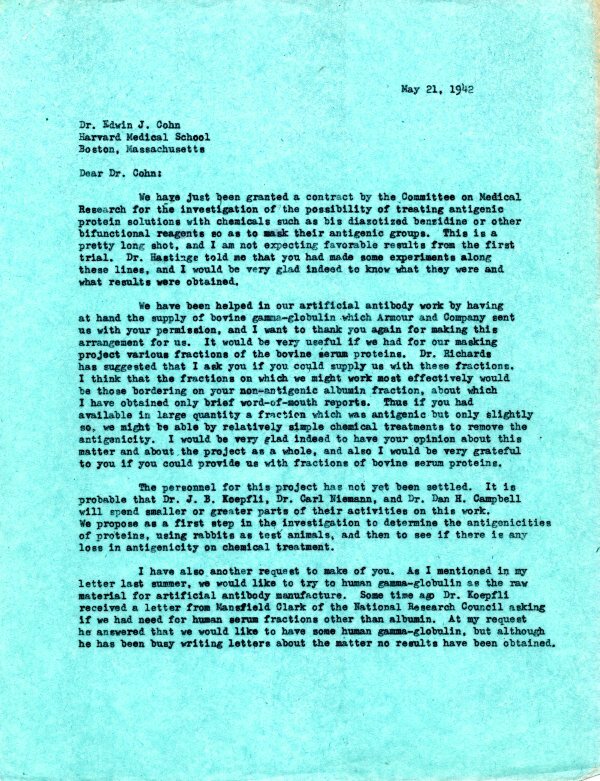 Despite Pauling’s enthusiasm and Addis’ promising results, the CMR did not believe Oxypolygelatin to be sufficiently superior to the pre-existing gelatin substance and, in the spring of 1944, the committee refused Pauling’s request for a renewal of contract. Surprised by the committee’s decision, he submitted a second request, asking that his contract be renewed for the period of four months, with no additional funding from the OSRD. His request was granted but, due to empty coffers, no progress was made. Pauling applied again in June, this time requesting extra resources for the project. Again, he was denied. Linus Pauling to A.N. Richards, June 14, 1944. The future of Oxypolygelatin research looked bleak, but Pauling and his team refused to abandon the project. Instead, they began making preparations for one final assault on the problem. Please check back on Thursday for the conclusion to this series. 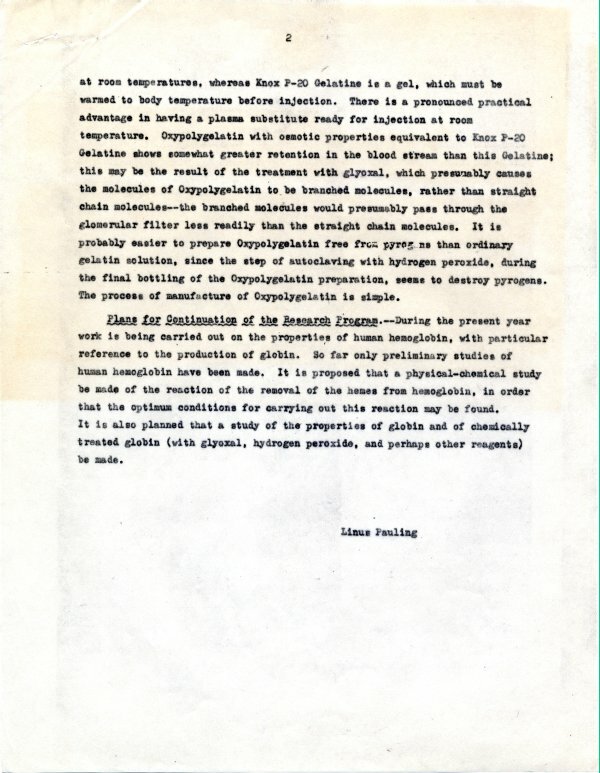 In the meantime, for more information on Pauling’s Oxypolygelatin research, read his 1949 project report or view this 1974 letter regarding the development of Oxypolygelatin production in China. For additional Pauling content, visit Linus Pauling: It’s in the Blood! or the Linus Pauling Online portal.